This is the procedure of making teeth whiter, and therefore more attractive. Our office uses several methods: custom tray whitening, and professional strength white strips. 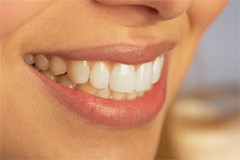 The tray method involves having impressions taken from which we fabricate custom vinyl trays . A carbamide peroxide gel is placed in these trays and the trays with gel are worn for about 3 hours, or overnight. The entire process takes 3-4 weeks of daily use. Three different strengths of gel may be used, however the higher the strength the greater the likelihood of reactions or tooth sensitivity. The tray method is recommended for badly stained teeth, such as tetracycline staining, and it may take several months of use to see significant color improvement. For maintenance of whitened teeth the trays should be used every several months. MTM Clear Aligner straightens your teeth with a series of clear, virtually invisible custom-molded aligners. By using a series of clear, removable aligners, it straightens your teeth with results you'll notice sooner than you think. The course of treatment involves changing aligners approximately every two weeks, moving your teeth into straighter position step by step, until you have a more beautiful smile. And unlike braces, these clear aligners can be removed while you eat and brush your teeth as usual.